Dr. Kristin Matthews of the BYU English department discussed contemporary Black Feminism at the Global Women’s Studies Colloquium where she revealed both the progress and pain that multi-generational black feminists continue to encounter as they learn to tell their stories like never before. Dr. Matthews spoke with confidence and conviction, but there was an urgency in her voice as she discussed a historic movement: “Today I’m sharing . . . work that is seeking to map out contemporary Black Feminism. The 2010s have been a great time for black women, for never before have black women possessed such a platform in publishing, entertainment, and politics.” Despite this platform that black women are obtaining, Matthews went on to disclose that black women are arrested at higher rates than white women, black women die at three times the rate of white women in childbirth, black women hold only 18 of the 535 seats in congress—and the list goes on. Nevertheless, she maintained a hopeful perspective that black women’s voices are louder and their stories are reaching a wider audience than in any previous decade. 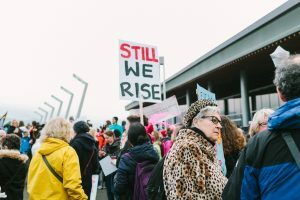 Black feminists in the twenty-first century are sharing their stories and raising awareness like never before; however, this progress can’t be credited to their efforts alone, but to the pioneering Black feminists who preceded them in the 1960s and 70s. Matthews asserted that Black feminist literature, especially essays and memoirs, offer a collection of readings that have shaped their Black feminist consciousness. 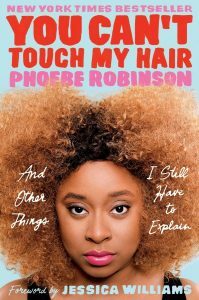 She cited comedian Phoebe Robinson as one who indirectly thanks predecessors Maya Angelou, Lorraine Hansberry, and Nina Simone in her book, You Can’t Touch My Hair when she laments: “You tell yourself, ‘And still I rise,’ ‘I’m black, and I’m proud,’ ‘I’m young, gifted, and black,’ and then you go to bed, wake up, and do it all over again. Every. Single. Day” (93). As Robinson demonstrates, literature has proven to be a valuable medium for Black feminists, and they’ve been publishing books at exponential rates. Matthews spotlighted several award-winning novels including New People by Danzy Senna, Sing, Unburied, Sing! by Jesmyn Ward, The Star Side of Bird Hill by Naomi Jackson, and the list goes on. This literature collectively details similar themes of sexual and economic violence, police brutality, and indifference to black suffering, yet it simultaneously surfaces awareness of these issues and weaves impactful stories that solicit change. Though multi-generational struggles of black women’s economic and social marginalization still persist, earlier Black feminists were limited to print as a medium to share their message. On the contrary, contemporary Black feminism, which has become a widespread multimedia movement, has specifically benefited from social media. Matthews highlighted several Black feminists working in a variety of fields—from writer Roxane Gay to producer Issa Rae, to Beyoncé herself—who are all using social media to engage in conversations about what it means to be a black woman today. While previous Black feminists like Angela Davis were initially skeptical of social media as an organizing force, Matthews pointed out that these platforms have the potential to “challenge the elitism of an academic Black feminism as they reach out to a broader audience.” This type of interaction creates an awareness and community for people who wouldn’t have had an outlet otherwise. Though Roxane Gay argues in her book Bad Feminist that “there’s no one right way to be a black feminist,” Matthews expressed that there are central questions concerning motherhood, violence, and the black female body that can unify all black Feminists and allow them to confront these struggles in a country that continues to limit their privilege. Matthews shared an excerpt from Revolutionary Mothering by Mai’a Williams and Loretta Ross who explain that, “It is a radical act to nurture the lives of those who are not supposed to exist.” This tragic, but powerful sentiment led Matthews to praise Black Lives Matter co-founder Patrisse Cullors and pregnant Beyoncé’s 2017 Grammy performance as brave portrayals and actions of revolutionary mothering. Matthews linked this concept of revolutionary mothering with America’s systemic racism. She argued that “Black feminists have always been at the fore of fighting state-sponsored violence in its various guises, whether that is oppression or indifference.” This notion of indifference was most poignantly portrayed in governmental response to Hurricane Katrina when wealthier, predominately white neighborhoods were recipients of coordinated evacuation efforts, while poorer, predominantly black neighborhoods were left to fend for themselves. Black women didn’t just experience this, but wrote novels about it—Matthews highlighted Beyond Katrina by Natasha Trethewey, A Kind of Freedom by Margaret Sexton Wilson, and Salvage the Bones by Jesmyn Ward as valiant portrayals of black suffering in impoverished neighborhoods in the American South. Emily covers events for the English Department of the College of Humanities and is pursuing a degree in English with a minor in writing and rhetoric.